In moving from Year 9 to Year 10, pupils embark on the fourth year of their GCSE course, as it is not possible for a pupil to adopt German in Year 10 unless he has done three years of German already. The study of German is a rewarding and enriching experience. The majority of students will have been on the Y9 Cologne trip, gaining important first?hand experience that can now be taken to the classroom. In Year 11, pupils are offered another opportunity to visit Germany by taking part in our highly successful and enjoyable student exchange programme with a school in Bavaria. This provides a unique insight into German everyday life and modern society and culture. German is not just a classroom exercise: it is a living language spoken by more people in Europe than any other language! 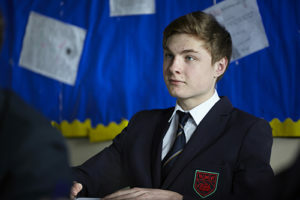 In the classroom itself, the two GCSE years are active ones, with a lot of ground to cover. The course’s emphasis is placed on broadening and extending a pupil’s ability to comprehend more complex texts and to communicate, express and justify ideas in the foreign language. A variety of resources are available: a course book plus corresponding booklets for exercises, grammar and vocabulary, plus interactive computer programs and specific websites as well as authentic films. Additional resources will be provided by each teacher, and can also be found in the school’s learning centre. Furthermore, the foreign language assistant will play a crucial role in offering guidance and practising oral fluency. Language learning concentrates on the familiar four skills of speaking, listening, reading and writing. Particular importance is placed on the acquisition of vocabulary and a solid understanding of grammatical skills (including the ability to form tenses correctly) in order to be able to express ideas and opinions effectively on a wide range of topics. Pupils are expected to show pride in the presentation and accuracy of all their work. Assessment continues to be in all four skills. Receptive skills, i.e. Listening and Reading, are assessed through examination at the end of the two-year course, counting for 20% each. The productive skills of Speaking and Writing are worth 30% each, and students are required to submit two tasks per skill (controlled assessments). These four tasks must cover four different topics, and at least one of them will be completed in Y10, usually in June. In choosing German, you are opting for two years of interesting, rewarding work, making holidays more enjoyable and work opportunities in the German speaking world a realistic possibility. Germany continues to play an integral part in European and global affairs, yet numbers of British people studying German are decreasing. Thus, a GCSE in German is more valuable than ever and provides a desirable skill for university applications and in the job market, even more so if seen as a stepping stone to A-level or IB. For further information, see here. And many others. It is also a useful skill in other areas, such as medicine, law or science, as there are strong links with the German speaking world.